The skeletal system consists of the bones (206 in adults) and joints, along with the cartilage and ligaments that occur at the joints. The skeleton supports the body. The bones of the lower limbs support the entire body when we are standing, and the pelvic girdle supports the abdominal cavity. The skeleton protects soft body parts. The bones of the skull protect the brain; the rib cage protects the heart and lungs. The skeleton produces blood cells. All bones in the fetus have red bone marrow that produces blood cells. In the adult, only certain bones produce blood cells. The skeleton, along with the muscles, permits flexible body movement. While articulations (joints) occur between all the bones, we associate body movement in particular with the bones of the limbs. Bones are classified according to their shape. Long bones are longer than they are wide. Short bones are cube shaped-that is, their lengths and widths are about equal. Flat bones, such as those of the skull, are platelike with broad surfaces. Irregular bones have varied shapes that permit connections with other bones. Round bones are circular in shape (Fig. 6.1). A long bone, such as the one in Figure 6.2, can be used to illustrate certain principles of bone anatomy. The bone is enclosed in a tough, fibrous, connective tissue covering called the periosteum, which is continuous with the ligaments and tendons that anchor bones. The periosteum contains blood vessels that enter the bone and service its cells. At both ends of a long bone is an expanded portion called an epiphysis; the portion between the epiphyses is called the diaphysis. Figure 6.1 Classification of bones. a. Long bones are longer than they are wide. b. Short bones are cube shaped; their lengths and widths are about equal. c. Flat bones are platelike and have broad surfaces. d. Irregular bones have varied shapes with many places for connections with other bones. e. Round bones are circular. As shown in the section of an adult bone in Figure 6.2, the diaphysis is not solid but has a medullary cavity containing yellow marrow. Yellow marrow contains large amounts of fat. The medullary cavity is bounded at the sides by compact bone. The epiphyses contain spongy bone. Beyond the spongy bone is a thin shell of compact bone and, finally, a layer of hyaline cartilage called the articular cartilage. Articular cartilage is so named because it occurs where bones articulate (join). Articulation is the joining together of bones at a joint. The medullary cavity and the spaces of spongy bone are lined with endosteum, a thin, fibrous membrane. Compact bone, or dense bone, contains many cylindershaped units called osteons. The osteocytes (bone cells) are in tiny chambers called lacunae that occur between concentric layers of matrix called lamellae. The matrix contains collagenous protein fibers and mineral deposits, primarily of calcium and phosphorus salts. In each osteon, the lamellae and lacunae surround a single central canal. Blood vessels and nerves from the periosteum enter the central canal. The osteocytes have extensions that extend into passageways called canaliculi, and thereby the osteocytes are connected to each other and to the central canal. Spongy bone, or cancellous bone, contains numerous bony bars and plates, called trabeculae. Although lighter than compact bone, spongy bone is still designed for strength. Like braces used for support in buildings, the trabeculae of spongy bone follow lines of stress. In infants, red bone marrow, a specialized tissue that produces blood cells, is found in the cavities of most bones. In adults, red blood cell formation, called hematopoiesis, occurs in the spongy bone of the skull, ribs, sternum (breastbone), and vertebrae, and in the ends of the long bones. Figure 6.2 Anatomy of a long bone. a. A long bone is encased by the periosteum except at the epiphyses, which are covered by articular cartilage. 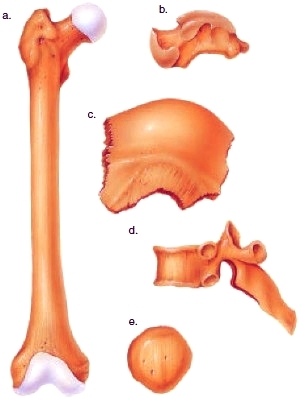 Spongy bone of the epiphyses contains red bone marrow. The diaphysis contains yellow bone marrow and is bordered by compact bone. b. 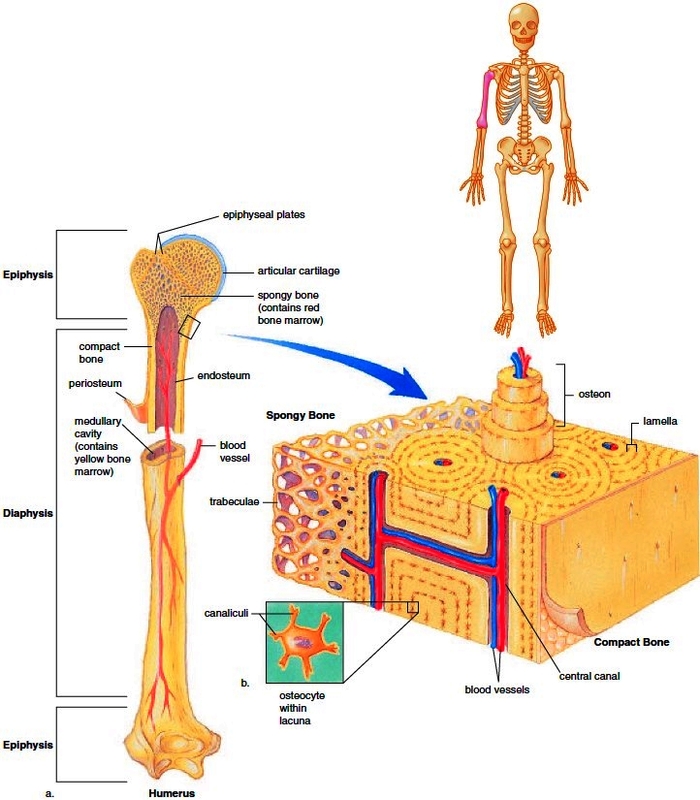 The detailed anatomy of spongy bone and compact bone is shown in the enlargement, along with a blowup of an osteocyte in a lacuna.